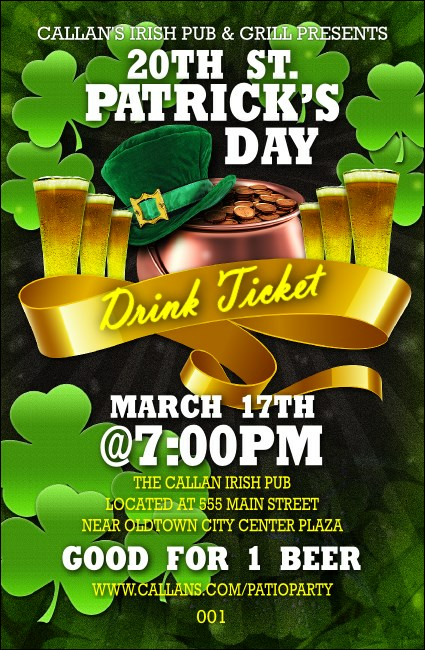 Treat your guests to a Guinness and share the luck of the Irish when you print St Patricks Day Party Drink Tickets for your next pub gathering. Bright green shamrocks, cold pints of beer, and a pot of gold grace the front of these Irish-themed ticket templates, along with numbering for security and easy event organization. You won’t need a rainbow to find the right ticket at TicketPrinting.com!